And check out the photo album of Memorabilia sent by classmates. Karin Pearce Coy sent us a copy of the June 1958 Sequoia Times which is full of the history of Sequoia. You'll see articles on Coach Frank Griffin, the demolition of the old Carriage House, the origin of the Japanese Tea Garden, a dedication to Don Bogie and Doris Dean who left at the end of 1958, information about Chief Sequoia, Otis Carrington, and former principal Argo, and pictures of old sports teams. 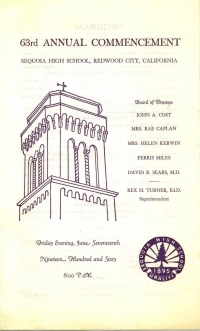 And Karin Pearce Coy also sent a copy of the Commencement Program for 1960 which has the names of the 463 who graduated with us. The names are listed, although there is a typo - the program calls us the graduates of 1959. At the end of January we made our first postal mailing to those who don't have email, giving them the overview of reunion events. The planning is underway for the gatherings. And we are still looking for the classmates on our lost list. As always, you are invited to join the reunion committee, or to volunteer to help in any other way (video taping, sending memorabilia, helping at the gatherings). It is going to be a great weekend. Please leave a message on this site for your fellow classmates. And keep signing on to get the latest info.